will continue its post-recession climb. “The housing market has improved, consumer confidence has steadily increased the last two years, and consumer spending is on the rise—all factors that are helping to fuel stable growth for the U.S. recreational boating industry…In addition, we’re seeing more and more Americans take to the water, as our participation numbers are at an all-time high—88 million Americans went boating in 2012. This indicates that with experience on the water comes an interest in life on the water and the subsequent purchase of a boat,” noted Thom Dammrich, President of NMMA. YachtWorld.com, a global brokerage sales database leader, research concurs; they report 2013 boat sales increases in both sail (up 5%) and power (up 6%) and sales were the highest since 2007, in both volume and value. * In 2014, NMMA expects that recreational powerboat sales will continue to grow another 5-7 percent….and sustained growth into 2016. 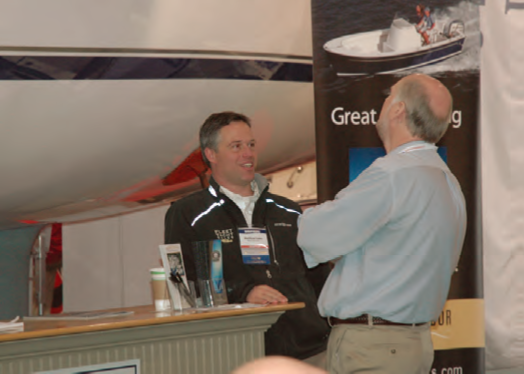 In addition to viewing boats and gear, boat shows are a great time to interview brokers and find one that you feel c-comfortable working with. Are they easy to talk to? Do they know their stuff? Are they selling you, or do they understand what you want and want to help you with your purchase? protects all parties in the purchase process. Understanding this agreement is extremely important and sets the expectation when all of the systems aboard cannot be fully tested in the off-season. A sea trial is part of the survey process. It is not just to feel the boat and see if you like how she handles. It is to fully test the engine under a load and run up to temperature, test the transmission and see the rig under load. If there is a problem found during survey that cannot be resolved with the seller, it is the buyer’s responsibility to put the boat in the condition she was found. There is a smart way to go about the survey process, so as not to over-extend the survey budget. If the boat is out of the water, it can be surveyed 90% of the way. This should give you a good idea of what you are getting into. Although we all think the winter lasts forever, the sailing season comes on fast in the spring. No one wants an improper survey. If the conditions do not permit, rescheduling to another time will need to be agreed upon by both parties. Moving through the purchase in a timely manner is beneficial to both buyer and seller. If the sale falls through, getting her back on the market ASAP helps the seller. The buyer gets back into the market before all the good ones that are priced right are sold. Spring and Summer are Fast Approaching. Are You Ready? on service. The Ocean State offers no tax on the summer or winter storage of your boat but that also includes any work you have performed,” said Miller. 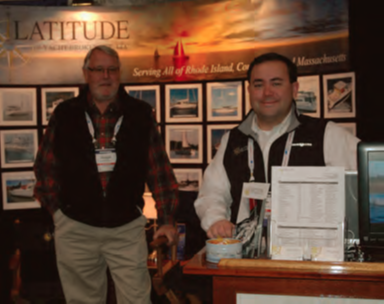 The first weekend of May (May 3-4, 2014), is the Rhode Island Boat Show. Spanning four locations, the show opens up different parts of Narragansett Bay to showcase what that town and marina have to offer. Each location has multiple area exhibitors with boats on display in the water and on land. For more information, check rhodeislandboatshow.com. Summer in Southern New England is a great time to get out and explore the coast and see what it has to offer. Nearly every weekend is full of events and activities. “If you are thinking of buying a boat for this season, there is time to shop and equip your boat in time for Memorial Day Weekend,” states Miller. “Time on the water is what you make of it, so please pick up your Windcheck Magazine monthly and check the Calendar of Events to make sure you are not missing out!” WindCheck will be running other brokers’ tips in coming months, so check back.